This study has been refreshed in November 2017 to keep you updated on the latest developments in the usage of emojis on Instagram. Since the early days of digital communication, it’s been common practice to use emoticons as a way to express feelings. After many years of using “:-)”, emojis, as we know them today, stepped into our lives. Research found that when we look at a smiling face online, the same parts of the brain are stimulated as when we look at a human face – so they actually show a real effect on human beings. Today, we don’t only use emojis when chatting with friends on Whatsapp or iMessage, but they are also used as a part of the social media communication of businesses. This is why we wanted to find out how and how often people currently use emojis, as well as whether posts containing emojis receive a higher amount of interactions. The following Instagram emoji study tackles all of these questions and reveals some great insights on how businesses can currently profit from emojis. In order to understand how emojis are used on Instagram, we analyzed around 29,000 accounts with 5.5 million posts between January 1 and July 31, 2017. Based on this data, we are now able to answer some interesting questions. To start with a bird’s eye view on how often emojis are used, we analyzed how many Instagram accounts had at least one emoji in their posts. We found that more than 50% – 56.5% to be precise – included at least one emoji in July 2017. 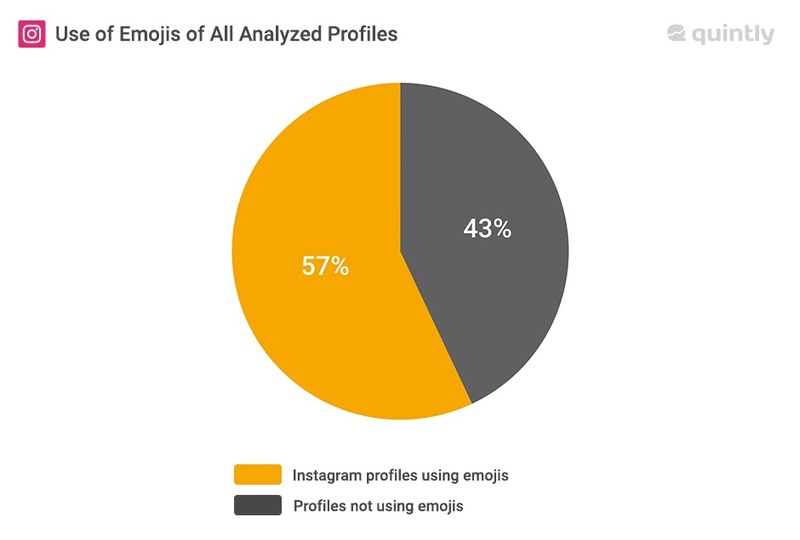 This shows that businesses seem to be interested in using emojis on Instagram, although their reasons might vary. Looking at the averages of all analyzed profiles helps us gather a general understanding of the emojis used. Whereas, this approach doesn’t look at different profile sizes in particular and these clusters vary greatly on all networks. That’s why we split all analyzed accounts into six groups. Here, it becomes clear that the smallest profile group containing 1 to 1,000 followers use emoticons significantly less than all other pages. In January 2017, just around 23% of all profiles in this cluster used emojis. Over the analyzed period, the use of emojis grew in this cluster by 1.3%, also showing the lowest growth of all six clusters. At the end of our analyzed period, on July 31, 24.3% of all accounts from 1 to 1,000 followers used at least one emoji in their posts. In order to receive insights on all profile clusters, check slide four in our Instagram emoji study below. Spoiler alert: The biggest pages analyzed used emojis in 83.3% of their posts! Comparing these numbers to our previous emoji study, we can see that growth in emoji usage has significantly slowed down since our last analysis. While the overall growth was 19% in 2016, we only detected a growth of around 3% from January to July 2017. This growth slump doesn’t necessary imply any negative effects though, as it is only normal that people don’t endlessly add more emojis to their posts it’s an expectable saturation. Instagram Emojis – More Often Seen in Image or Video Posts? After learning how often emojis were used, we were eager to dig deeper. Now, we used the aggregated data to find whether there is a difference between images and videos. However, we found no stark difference here: around 31% of all image posts and 29% of all video posts contain emojis. Based on these findings, we can say that businesses are equally likely to use emojis in images as well as in video posts. Before we answer the question if emojis actually help businesses receive higher interactions on Instagram, let’s have a look at the most frequently used emoticons. 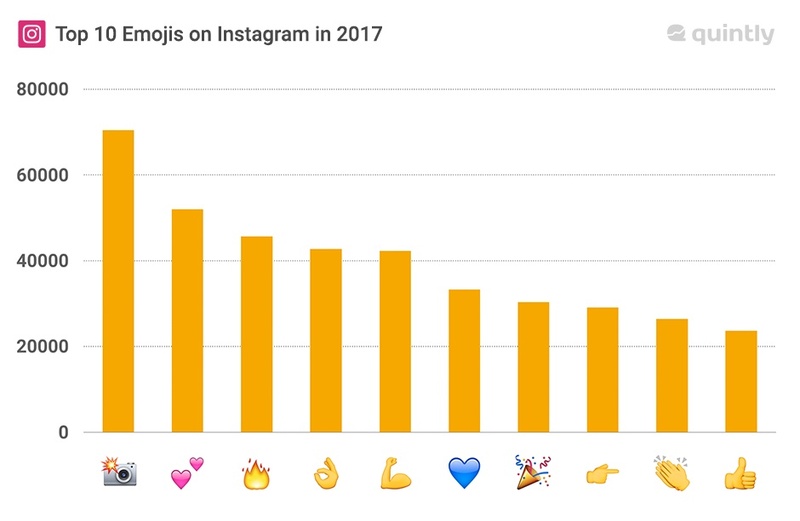 Of all nearly 2,000 existing emojis, the following chart shows you the ten most popular emojis on Instagram for the analyzed period. Which of these did you use in the analyzed period? Including new emojis in your posts might further improve the interactions you receive on videos and images. The camera icon is the most frequently used emoji on Instagram. Last year, we analyzed the New York Times Fashion on Instagram and discovered that the “ ” is the most used emoticon there, and the same holds true for this study. Interestingly, among the most used emojis, there is no “classic” smiley one like . After finding out which emojis are the most popular ones, we asked ourselves which of these create the biggest impact in terms of interactions. To measure this, we chose to compare the interaction rates that the emojis get and we found out something quite interesting. Download the full study report to see which emojis perform best! Do emojis lead to more engagement? Yes! Our analysis shows that posts containing at least one emoji receive 47.7% more average interactions per post in the analyzed period. This clearly shows that emojis aren’t just fun decoration but a means to engage better with your audience. The interaction rate makes profiles of different sizes comparable and thus delivers another balanced out view on the increase of engagement. This metric underlines the revealed facts again and shows a 15% difference of posts with vs. without emojis. Access the free study above to find how much higher the received interactions are while using emojis, specifically for your profile size. In order to keep track of interactions you receive, it’s essential to approach the measurement of your Instagram activities, to constantly improve your strategy. Emojis are used by the majority of the analyzed Instagram profiles, but the adoption pace is slowing down. The study also found that the “camera with flash icon” was the top Instagram emoji in between January and July 2017. Finally, we were able to prove that emojis lead to higher interactions and certain ones to more than others. To formulate a key takeaway from this Instagram emoji study, we can say that emojis can be greatly beneficial to improve the number of interactions. With that said, businesses should try to include emoticons to express feelings and give a more personal touch, but they also need to be careful to not overuse them. While reporting to your team it also would make sense to show if emojis led to higher engagement in your specific case. If so, also showcase which emojis performed best. The same applies to other social media KPIs, which are included in the report. Start your Instagram analyis to see what pays off. Here's a detailed guide on how to approach Instagram measurement correctly. Any questions on this? Never hesitate to send us a tweet!